Dal fry is one of my favorite easy to prepare side dish. I like to have it with chapati, roti, phulka or steamed rice and ghee. It is a simple comfort food. Dal fry is a very popular Indian dish or it could be said, a popular punjabi side dish. It is usually prepared with Toor dal, also known as pigeon pea lentils. One could also use moong dal or channa dal, but i personally like toor dal. There are many varieties of preparing dal recipes in India. The most commonly found recipes in Indian restaurants are the Dal fry and Dal tadka. Since dal fry and dal tadka are prepared differently, so both have different tastes and flavors. In dal fry, the dal is boiled and cooked till it is soft. Then onions, tomato, carrot, green chillies and spices are sauteed in oil or ghee, and is added to the cooked and mashed dal. 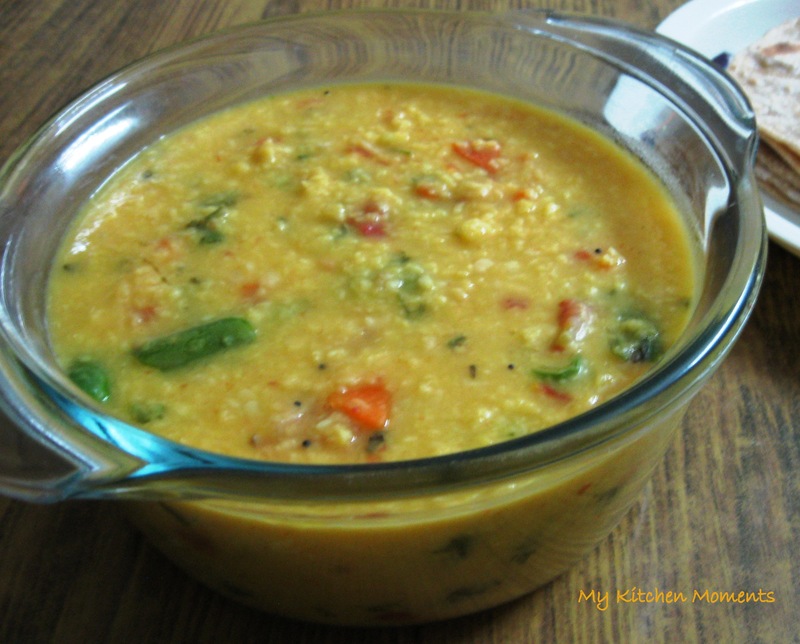 It is then simmered until the dal gets flavored with spices, vegetables and herbs. Whereas in Dal tadka, the dal is cooked with onion, tomatoes, carrot or any vegetables of your choice. Then a tempering or tadka of spices like mustard or cumin seeds, red or green chillies, asfoetida, fenugreek seeds are prepared and added to the cooked and mashed dal and served as such. Pressure cook the dal with required water and a pinch of turmeric powder until 4 to 5 whistles. You can also cook the dal in a heavy bottomed pan / kadai with water and turmeric powder. But stir frequently to aviod charring of dal at the bottom of the pan. Mash the dal and keep aside. Heat oil or ghee in another pan, add mustard seeds. Once it splutters, add the green chillies, tomato, carrot and curry leaves. Stir fry till the tomato becomes soft and oil leaves the sides of the pan. Then add the mashed dal to the fried mixture. Add little water, salt and simmer till you get a smooth and slightly thick consistency. Then garnish with chopped coriander leaves, mix well and remove from flame. Before serving, add the lemon juice. Serve with chapati / roti / phulka / steamed rice along with onion raita, curd and lime / mango pickle. You can also add chopped onion, ginger – garlic paste and red chillies instead of green chillies. Spices like red chilli powder, asafoetida, fenugreek seeds, cumin seeds can also be added. Dal fry can also be made with one single dal or a combination of toor dal (yellow pigeon peas), yellow moong dal (split yellow peas), channa dal (bengal gram dal) and masoor dal (split red lentils). 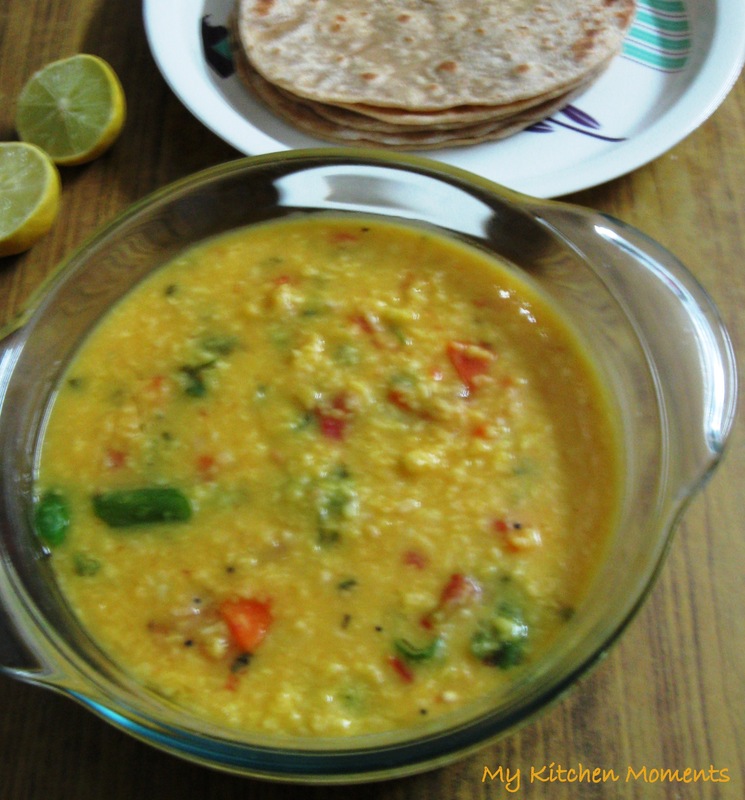 Another method of preparing dal fry is by cooking the toor dal in a heavy bottomed pan or vessel with water. When dal is half-cooked, add the carrot, tomato and turmeric powder and simmer it until it is cooked to a mashed consistency. Add water as and when necessary and stir frequently to avoid burning of dal at the bottom of the vessel. Add the chopped coriander leaves and curry leaves and mix well. Remove from flame. Temper the mustard seeds with little coconut oil, green chillies and pour over the dal. Just before serving, add lemon juice and serve warm with chapati or rice. So yummy! Can’t wait to make some very soon. Oh plz do try it and let me know how it came for you.. Thank you for sharing your thoughts! !